Beautiful Butterfly - Storage Hamper. Keep your nursery neat and tidy with this versatile storage hamper. Adorned with beautiful butterflies in shades of lavender, purple, aqua, green and white. Use as a clothes hamper or convenient storage for toys. Side handles for easy lifting. 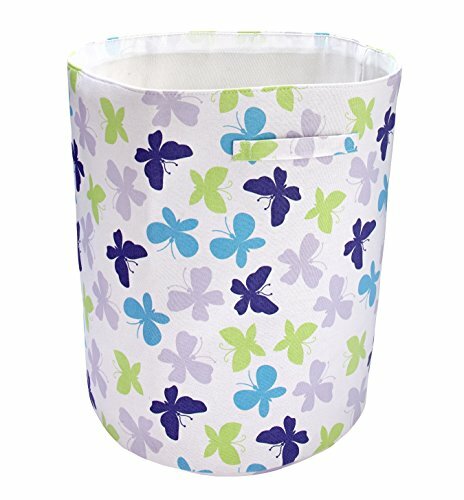 Dainty butterfly print hamper measures 19"H x 15.5"W.
Helps to keep your nursery organized, this storage hamper measures 19 x 15.5". Can be used as a hamper or decorative storage. Beautiful addition to your Beautiful Butterfly Nursery. Featured butterfly Print on Canvas - 80%Cotton/20%Polyester with a solid white lining. This pretty butterfly pattern comes in soft shades of lavender, purple, aqua, green and white. If you have any questions about this product by NoJo, contact us by completing and submitting the form below. If you are looking for a specif part number, please include it with your message.